On April 15, 1865 citizens of Cleveland, Ohio, gathered on Public Square to mourn the death of Lincoln by assassination. 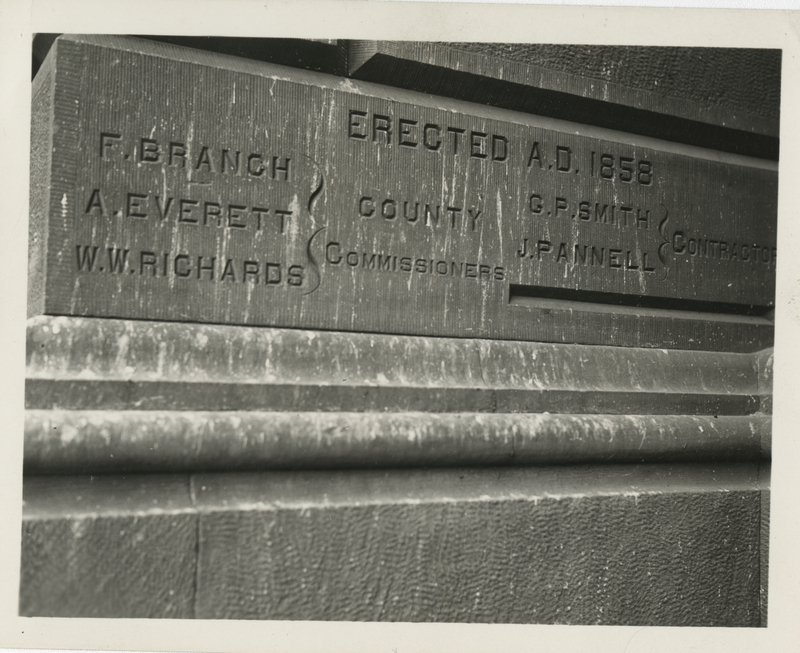 The architect for the nearby Cuyahoga County Courthouse, J. J. Husband, was heard to say that Lincoln's death was "no great loss." The crowd turned on him, chasing him back to his office, also nearby, and he later that day fled Cleveland for good. Several members of the crowd went to the courthouse, then on the NW corner of Public Square, and chiseled out his name, vowing that his name would never be spoken or read in Cleveland ever after. See "Traitors at Home," a news article appearing the following Monday in the Cleveland Morning Leader, also uploaded to this Remembering Lincoln archive. Shown here is the cornerstone as it appeared in 1930s, when the building was demolished. Permission for personal or research use; publication or reproduction requires written permission from the Western Reserve Historical Society.